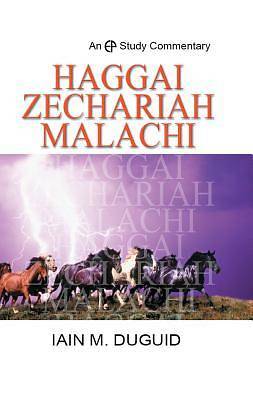 The last three books of the Old Testament, Haggai, Zechariah and Malachi, have not always received the attention they deserve from the church. This is in some ways surprising, since the Gospel writers quote Zechariah 9-14 more often than any other biblical source in explaining Christ's sufferings and death. The application sections show how the person and work of Christ are anticipated in these prophets. One reason for the tendency to neglect these three books lies in the fact that they address a community who were living in a day of small things, with little glory and no great triumphs to show off to a watching world. In a day like ours, which puts such a premium on charismatic leaders whose ministries exude glory and success, they may be viewed as something of an embarrassment. But if, like the apostle Paul, we are content to be broken vessels without glory in ourselves so that the glory of Christ crucified may be all the more plainly displayed, then we shall find much blessing in these books. In them, we shall read of the comfort and challenge that come from the presence of the living God in our midst, even when his glory is not on public display. In them, we shall also read of the anticipation of the day when the glory of God would come to earth in the person of Christ and bring about the long-promised salvation of his people.